Last night I mentioned we were in Eataly (for a fresh loaf of bread). We were browsing the aisles of olive oil, talking about how hard it was to pick. We we schooled in the under notes of grass and pepper from the sales person at O&Co last year. Well, what do you know, he was at Eataly doing a little sampling! I recognized him from the glasses. Nicholas Coleman did a few classes for Mario Batali, and apparently created his own role at the mega Italian store/restaurant. He is the official Olive Oil Specialist. He told us they have great oils for half the price at O&Co, and you don’t need the $7 spout they sell (thanks, we bought one). 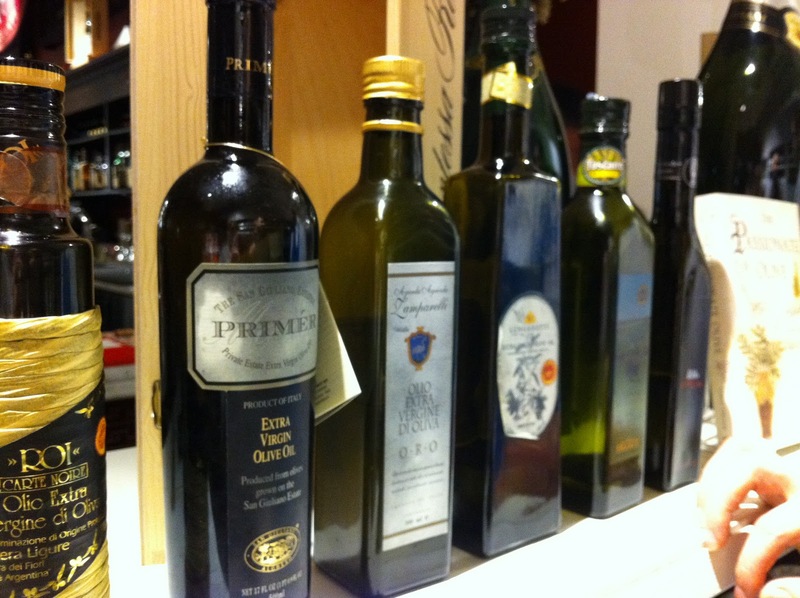 These are all Italian olive oils, from a variety of regions. We tried a great oil that starts out grassy and ends with a nice peppery finish. It’s bold, I guess you could say. And is great with bread. So we decided it needed to live at home with us. 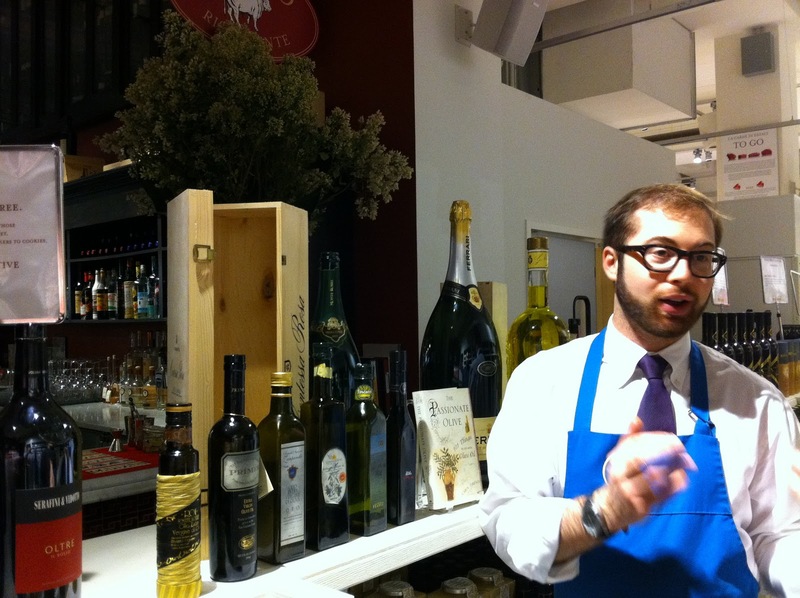 Nicholas runs a class at La Scuola di Eataly. 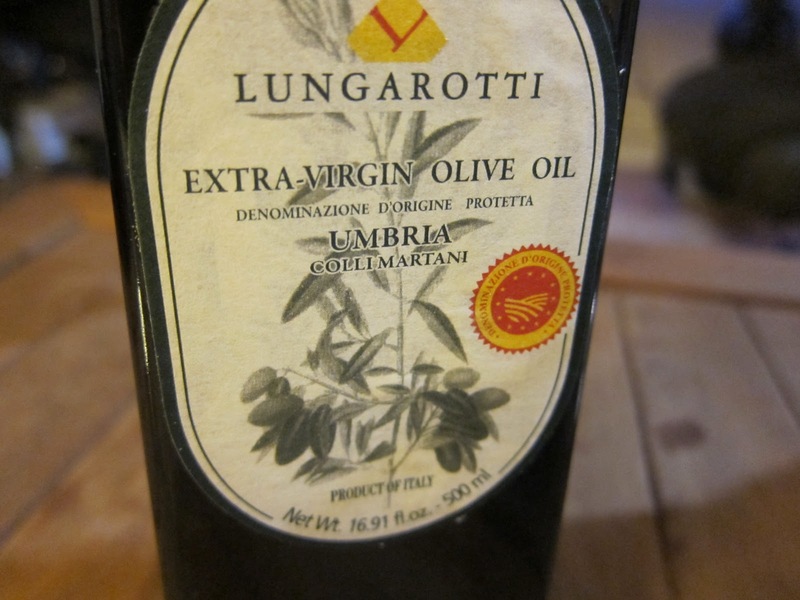 He takes you on an Italian tasting tour of oils, and you sample some dishes cooked/made with the oils. Something I’d definitely consider in the future. < Previous Panettone Time, Already? First I have to say that I am very pleased that I could finally buy a nice bottle of oil for less than $15! Second Im sorry but oil specialist?? Sounds like somebody that needed a job and created one for themselves. I hope I am not sounding too much like a hater but really..?!! Well, he did create this job! And I thought he was a guy just stuck doing retail at Grand Central, hahaha. Yes, so this was a less than $20 bottle (we still buy trader joe's for cooking).